Continuing our series on modern day speakeasies, today's feature is about a speakeasy in Seattle's Capitol Hill area called Thread & Needle. 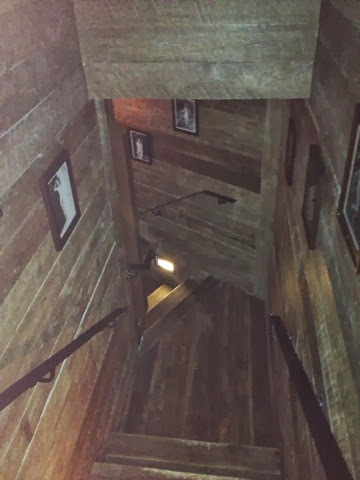 The entrance is located inside another bar -- called Tavern Law, so it's really a bar within a bar and reservations are required. 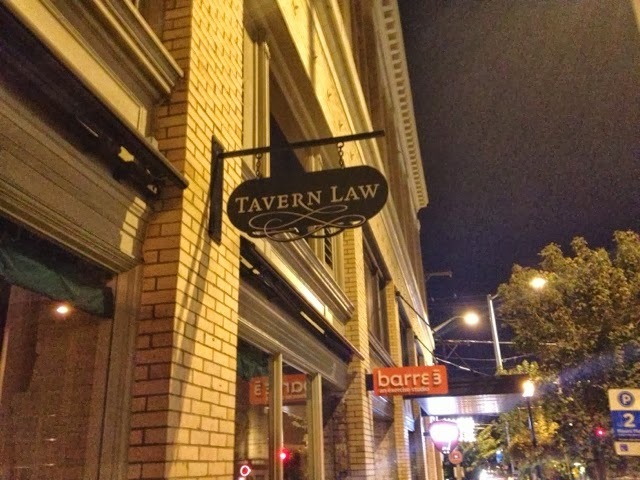 Tavern Law is easy to find and clearly marked. 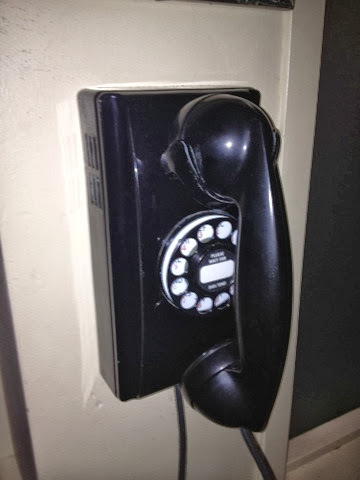 Once you get inside, you call on this phone to let the Thread & Needle crew upstairs know that you've arrived for your reservation. There is no password required. The space is small and intimate, and 1920s music plays in the background. We decided that the bar downstairs had a better vibe and that when we came back it would be to Tavern Law instead of Thread & Needle. Thread & Needle's specialty is choosing drinks for you based on your preferences. The waiter just asked us a few things we liked then the bar tender made our drinks. This is was similar to what San Jose's Single Barrel speakeasy bar does, but Single Barrel interviews you more extensively and as a result delivers better matches when we've visited. My friend asked for something with Tequila and cinnamon, and enjoyed his drink which had Mezcal, cinnamon syrup, curaçao and Gran Classico. He liked it. 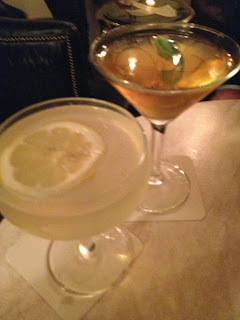 I asked for a champagne cocktail with citrus, but specifically not a French 77 or 75 because I wanted to try something new. They brought me a French 75 and I drank it anyway. It was disappointing. Thread & Needle serves the same food that is served downstairs at Tavern Law, and menu items include a burger, fried chicken, flat iron steak and mac and cheese. Thread & Needle is above a bar called Tavern Law located at 1406 12th Avenue in Seattle, Washington. Parking can be challenging. Reservations are required for Thread & Needle, but not for Tavern Law. Reservations are made for two hour intervals starting at 5:00 pm most nights. There is no signage for Thread & Needle. I am bummed you didn't enjoy this as much as others. I am overdue to hunt a new place down! What a disappointing experience. I'm sure the drink cost a pretty penny too! Maybe it was just an off night. The concept is great.